Beware the 3 Cs! | Train Positive Dog! Halloween is one of my favorite holidays, but not so much for my dogs. Candy: Not good for dogs. Chocolate is toxic in moderate to large amounts, and the sugar and extra fat is not what your dog needs added to his diet. Sugar is attractive to all mammals, so if big bowls of candy are within reach, expect that your dog will want to sample. And they won’t just eat the candy, but will probably eat the wrapper, too. That can cause a bowel obstruction and a veterinary emergency. The artificial sweetener Xylitol is toxic to dogs, and is found in many candies. Raisins and macadamia nuts are also toxic to dogs. Costumes (on your dog): Your dog probably doesn’t want to wear a costume. If your dog likes to wear a coat or sweater (really likes it, not just tolerates it), he will probably be fine with a costume of similar size and weight. If your dog doesn’t routinely wear a coat or sweater, now is not the time to expect that he will be fine with it. Your dog is probably used to wearing a collar, there are millions of decorative collars available – try one on for size! Costumes (on humans): Your dog will probably experience a succession of children dressed in costumes ringing your doorbell as an invasion of space aliens! Think of your dog’s brain a bit like that of a 2-year old human – a familiar human in a mask or strange hat, or a costume that changes the familiar shape of the body is not recognized as familiar, but appears as a scary monster. Your dog is likely to be afraid, or over-excited, and possibly aggressive. It’s not his fault, you have changed his comfortable home into an unfamiliar, scary environment. So, keep your dog away from the trick-or-treaters, away from the front door, while that activity is happening. 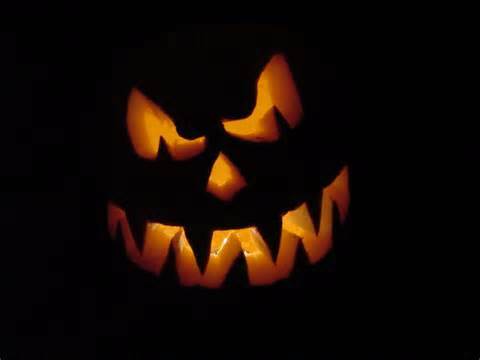 Candles: Often found inside of carved pumpkins, or used as decorations, candles present a real fire danger if they are accessible to pets and children. Think about your dog’s tail sweeping through a candle flame in a moment of your inattention YIKES! Check out the video below from Dove Lewis Emergency Veterinary Hospital and enjoy the holiday safely.